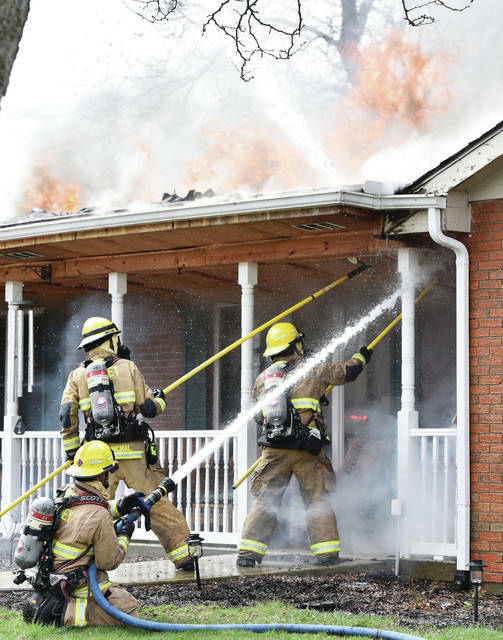 Sidney firefighters battle a fully involved house fire at 2021 Old English Court on Wednesday, April 10. 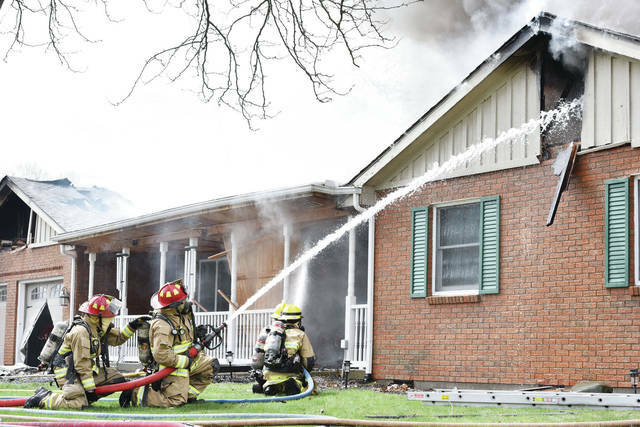 The Sidney Police Department reported that Sidney Police rescued a man and two dogs from the house at 11:33 a.m..
Sidney firefighters battle a fully involved house fire at 2021 Old English Court on Wednesday, April 10. The Sidney Police Department reported that Sidney Police rescued a man and two dogs from the house at 11:33 a.m. Firefighters tear open the ceiling of the porch so the water can reach the fire inside. 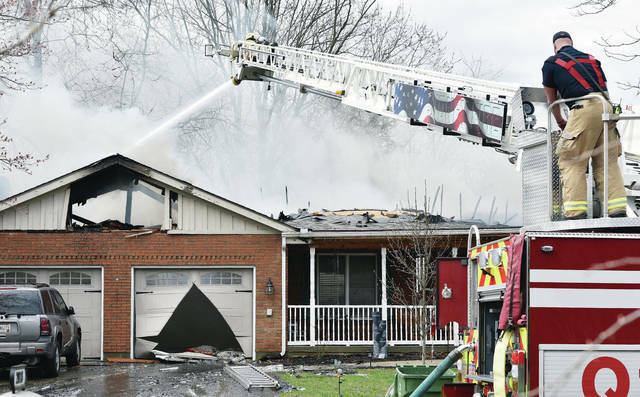 A Sidney firefighter blasts water into the roof of the garage. 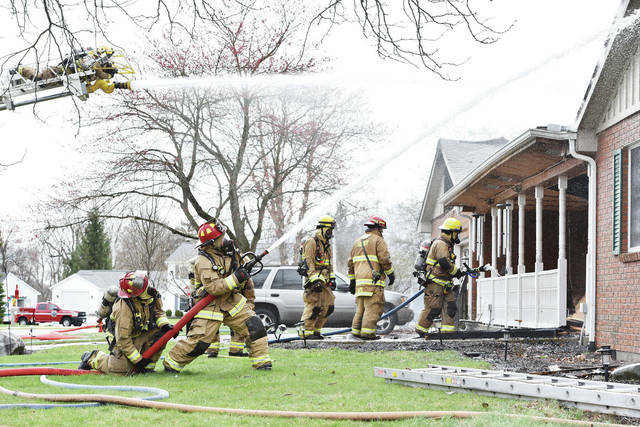 Sidney firefighters move a hose into position. 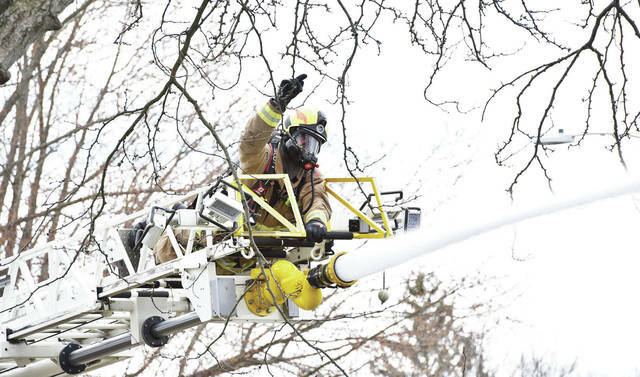 A sidney firefighter signals the direction they want their ladder to move. 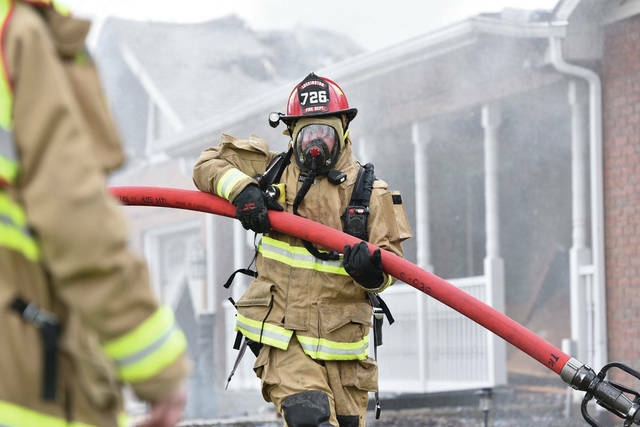 A Lockington firefighter moves a hose into position. 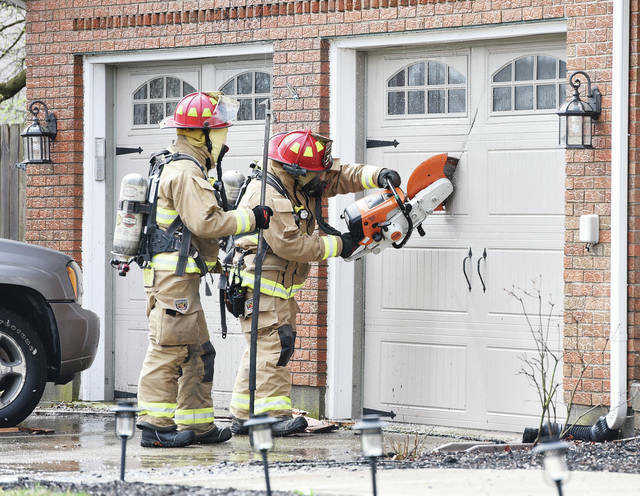 A Lockington firefighters cut open a garage door. 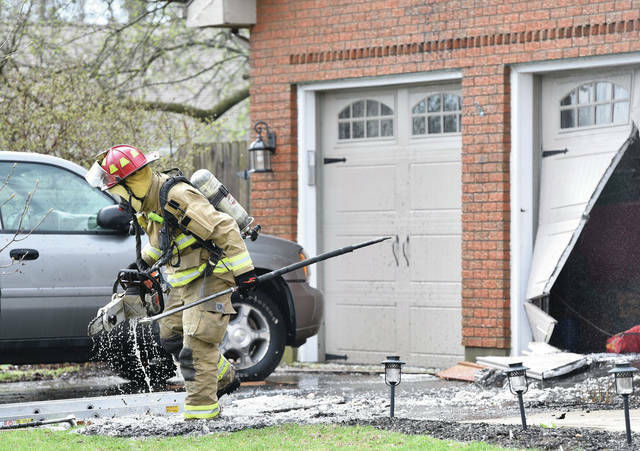 A Lockington firefighter walks away from the garage as built up water pours out and drips from the chainsaw use to cut open the garage door. 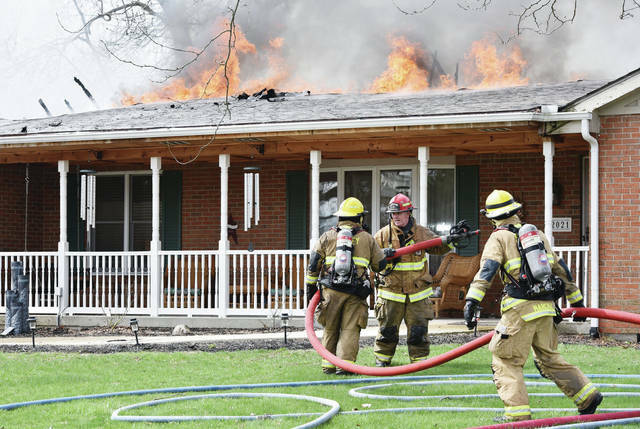 Sidney, Lockington and Anna firefighters battle a fully involved house fire at 2021 Old English Court on Wednesday, April 10. 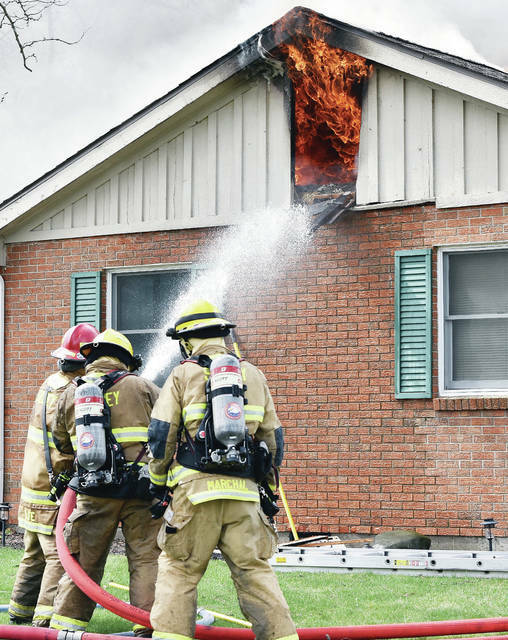 The Sidney Police Department reported that Sidney Police rescued a man and two dogs from the house at 11:33 a.m..
Sidney, Lockington and Anna firefighters battle a fully involved house fire at 2021 Old English Court on Wednesday, April 10. 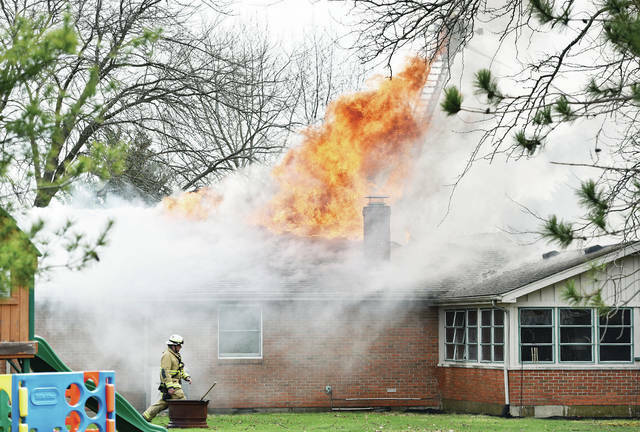 The Sidney Police Department reported that Sidney Police rescued a man and two dogs from the house at 11:33 a.m.
A Sidney firefighter pours water from a ladder onto a fully involved house fire at 2021 Old English Court on Wednesday, April 10. 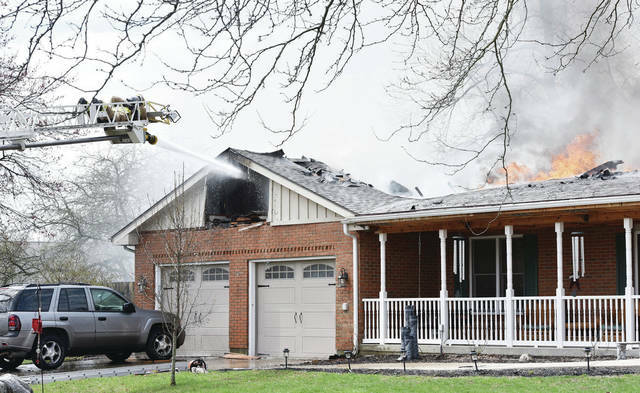 The Sidney Police Department reported that Sidney Police rescued a man and two dogs from the house at 11:33 a.m.
https://www.sidneydailynews.com/wp-content/uploads/sites/47/2019/04/web1_SDN041119Fire3-2.jpgSidney firefighters battle a fully involved house fire at 2021 Old English Court on Wednesday, April 10. The Sidney Police Department reported that Sidney Police rescued a man and two dogs from the house at 11:33 a.m..